The members of every team and workgroup develop particular ways of interacting with each other over time. Effective interpersonal communication among members and successful communication with managers and employees outside of the team are critical components of team functioning. How a team makes decisions, assigns work, and holds members accountable determines whether or not the team is successful. With so much riding on the outcome, it doesn't make sense to leave interactions to chance. If you form team relationship guidelines, or team norms, early on to ensure team success, you can shape the culture of the team in positive ways. Team norms are a set of rules or guidelines that a team establishes to shape the interaction of its members with one other and with employees who are external to the team. Team norms can be developed during an early team meeting, preferably the first meeting, and more norms can be added as the team deems necessary. Once developed, team norms are used to help guide the behavior of team members and are used to assess how well team members are interacting. These guidelines enable members of a team to call each other out on any behavior that is dysfunctional, disruptive, or that is negatively impacting the success of the team's work. Perhaps Ken Blanchard, co-author of "The One Minute Manager," said it best when he equated a river without banks to a pond. Likewise, a team without relationship norms leaves itself open to expand into potential interpersonal problems. Predictably, teams can have trouble with particular components of interpersonal communication and interaction because they put a lot of diverse personalities and backgrounds into one space. 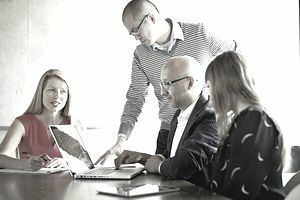 Team members as coworkers: All team members are equal; every team member's opinion will be thoughtfully considered; each team member will keep all commitments by the agreed upon due date; each team member agrees to constantly assess whether team members are honoring their commitments to the team norms. Team member communication: Team members will speak respectfully to each other, will not talk down to each other, and will recognize and thank each other for their contributions. Team member interaction in meetings: Team members will listen without interrupting; hold no side or competing conversations; follow the rules for effective meetings; attend meetings on time; end meetings on time; work from an agenda; use minutes recorded at each meeting as reference points. Team organization and function: Leadership will rotate monthly, the team management sponsor will attend at least one meeting a month. Team communication with other employees including managers: Team members will make certain they have agreement on what and when to communicate, and complaints about team members will be addressed first among team members. Team problem solving, conflict resolution, and decision making: Team members will make decisions by consensus, but the majority will rule if a timely consensus is not reached, and conflicts will be resolved directly among the people in conflict. Team norms can be expanded for your specific needs and can encompass as many topics as the team deems necessary for successful functioning. It's best to start with a few team norms and add more norms as needed. Make sure your team norms are written and posted where team members are reminded of their commitment.